William Ashley Sunday was born in Ames, Iowa as the son of a Civil War soldier, on November 19, 1862. Because his father died when he was less than a year old, “Billy” was raised in an orphanage. His young days were hard, working in a hotel and later for Colonel John Scott. During high school young Sunday worked as a janitor. In 1883 he joined the “White Sox,” becoming a professional baseball player; he played in the major leagues for seven years. He was converted to Christ in 1886 through the street preaching of Harry Monroe of the Pacific Garden Mission in Chicago. Sunday gave up his baseball career in March, 1891 to become an assistant YMCA secretary. After three years of work at the YMCA and acting as assistant to Dr. J. Wilbur Chapman, Sunday began preaching in his own services. He was ordained to the ministry in 1903 by the Presbytery of Chicago. Sunday preached in the army camps during World War I and later held city-wide meetings in the various cities across America. He refused to accept invitations offered him to go abroad. In one meeting in Philadelphia over 2.3 million attended his crusade during a period of eight weeks. Sunday held campaigns for over twenty years and literally “burned out for Christ.” At the close of each service throngs of people came forward and grasped the evangelist’s hand to signify their conversion. Such action was called “hitting the sawdust trail” because the tabernacle floors were covered with sawdust. Sunday was noted for acrobatic feats on the platform as he preached. The worst ever said of him was that he occasionally let his humor run wild; the best ever said about him was that he reached a million lives for Christ – the drunken, the down and out, the homeless, the common man. His blazing-fisted bare-handed evangelism lives in American history. He was probably a factor in preparing the country for the passage of the Eighteenth (Liquor prohibition) Amendment to the US Constitution. 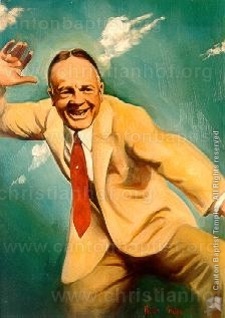 Billy Sunday died in Chicago, November 6, 1935; services were held in the Moody Memorial Church with 4,400 present.